Add a name for your newsletter and specify the newsletter's "From" & "Reply to" addresses. Tip: If using the WYSIWYG editor, you will also gain access to the Mailing Wizard that can visually help you create your messages as well as add product listings to your message! Once you are satisfied with the contents, save this email using the "Save" button located at the top right. As of Version 8, you will be able to send yourself a test newsletter at any time during the creation process to see how the format of the email is coming along. To send a newsletter test message, click on the "Action" button at the top right of the page and select "Send Test E-Mail." This will allow you to enter your email address and send yourself a test message as needed during the creation of the newsletter. After creating and saving your newsletter, you will be taken back to the Newsletter list that contains all of your saved Newsletters. To send a newsletters, follow these steps. Place a mark in the checkbox to the left of the listed newsletter that you wish to send. Now, look towards the right hand side of the screen in the "Action" column and click on the drop down arrow. The page will refresh with details of how many messages will be generated for this mailing. Please take a moment on this screen to review your specific plan's newletter limits. 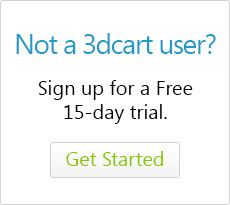 Each 3dcart plan comes with a specific limit on the amount of newsletter emails that can be sent per month. For more information, please review our pricing plan located here. You will now be prompted to enter a test email. The system will first send an email to this address so that you can make sure the email is formatted properly. Click on the "Continue to Step 3" button to proceed to the next step. If the email did not look right, you can return to the email, make changes, and start the process again. The system will process the request and send the emails in your newsletter list.